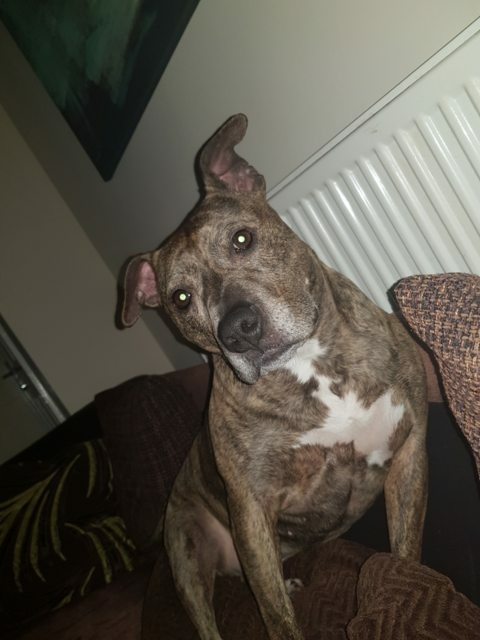 Millie is a 9-10 year old female Staffordshire Bull Terrier. Millie is a gorgeous girl who loves to play, she has lived with children and enjoys their company. She really enjoys going out and about and playing catch with her ball. Due to unforeseen circumstances Millie needs to find a new home. She was rescued when she was 18 months old and has been the most loving and loyal dog, her owners loved her. Unfortunately due to a change in circumstances and the sale of her home she needs to find a new home. She is good with children however not very good with other dogs or cats. She loves to play and have loves lots of cuddles and fuss. Although she is getting older she is still fit and loves going for walks especially playing catch with her ball which she will keep bringing back for you to throw until she is too tired and wants a rest. She is not very keen on the rain but loves to lie in the sun or in the winter loves to curl up by the fire and sleep. The other thing to mention is that she does have a tumour, at this stage the vets are taking no further action as it’s slow growing and isn’t being treated as it isn’t causing her any problems. Current location is in a foster home in Stratford Upon Avon, West Midlands, near Birmingham. 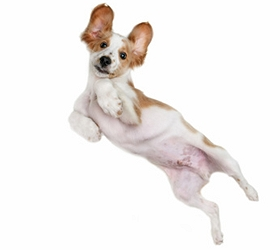 Vaccinated, wormed, flea treated, Spayed, Microchipped, FREE 4 weeks Pet Insurance to be activated from the link on our website. Any known health issues NONE KNOWN.